If you thought that choosing an inflatable kayak was just a question of doing a quick search on Amazon and choosing the cheapest, you couldn't be more wrong. 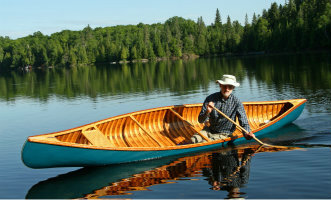 There are many shapes and sizes of boat made with many different uses in mind. We'll be looking at all the aspects you need to consider when choosing your craft. The attraction of an inflatable kayak for many is the ease of transport and storage along with a reasonable price. The average inflatable kayak able to accommodate two people might weigh between 14kg and 18kg although you will find lighter models going as low as 11kg and heavier models with various additional features weighing more. Some pack up into backpacks and can be taken on aeroplanes as hold luggage. Folding down to a nice compact size there is no need for any special storage space at home and they can easily be popped in the back of a car or truck or kept at a holiday home or caravan. Prices vary tremendously but a budget of $300 - $500 will give a good range of models to look at whilst cheaper (and more expensive) versions are available. What are Inflatable Kayaks Used for (and what is your Budget)? Because of the range of different shapes and sizes of inflatable kayak you need to think about how you are going to use your craft before you start shopping. It's also worth looking at what your budget is. With boats ranging from $100 to $1500 or more (£50 to £1000 or more) you get very different craft at each end of the spectrum. Don't forget you will also need a pump, paddle and buoyancy aid or PDF. The boats at the lower end of the market will be glorified blow up lilos, great for a splash around in the pool, but with minimal rigidity quite saggy and not good for paddling any distance. This does not stop them from being a great entertainment for all the family very close to shore on a hot sunny day. To get an inflatable boat that performs reasonably well you need to look for some rigidity in the hull. Read the next section on construction below to see what to look for and to ensure you get what you are hoping for out of your boat. These kayaks are used for an amazing variety of paddling. Widely used as fishing platforms the better quality boats are used for everything from river running to lake paddling in wind and waves with or without sails attached and alone or with the family. Look for the flatter bottomed varieties for river running where manoeuvrability will be needed but look for a bit of a v shape and or keel to aid tracking if using on lakes or other flat water or paddling any distance. You do need to ensure you are happy with the structure of your boat before venturing too far away from shore especially if you are on the heavier side. Some forums talk of kayaks Taco Chipping. (or sagging in the middle) and presumably filling with water with a larger paddler sitting in the wrong place in the wrong boat! We 'll try to keep this simple even though its not! There are quite a few variations. Before we start explaining bear in mind the properties we are after. We want a waterproof material that folds up easily and is compact. We'd like it to be light weight but durable and not likely to tear or puncture. We want the finished craft to be rigid so that it performs well and we don't want the material to stretch out of shape under pressure. We also want it to be easy to make really strong seams that won't come apart under pressure. Oh and for good measure we want it to be a sensible price to make nice inexpensive boats and environmentally friendly! Not asking for much then are we..... in case you hadn't worked it out there will be some compromises to be made. The cheapest inflatable kayaks and pool toys are made of PVC. PVC is inherently stretchy so as you blow them up they stretch like a balloon. They are not very rigid and do not hold their shape well. Also PVC does not have a very good reputation for its impact on the environment. If you put a layer of a woven fabric alongside the PVC you get the waterproof properties of the PVC with the strength to stop the stretching. The two materials used are polyester and nylon. Polyester is more expensive than nylon but does not stretch whilst nylon still has some stretch so does not make for particularly rigid boats. However, the ability of the nylon to stretch does make it less likely to puncture or tear (as it stretches instead). You will find PVC coated polyester inflatable kayaks. These PVC coated fabrics are reasonably priced, can be made in a range of colours, have low drag and seams can be made by gluing or welding both of which make strong seams. You will see references to denier and decitex which refers to the weight of the fabric. Decitex is the metric equivalent of denier and 1100 decitex = 1000 denier. As a rule of thumb light duty inflatables might use 420 or 840 denier fabric whilst for a durable finish commercial boats are likely to be made from 1000 - 1500 or more denier fabrics. Inevitably the higher the denier the heavier the material will be as well as more rigid and more durable. Moving away from PVC we have the rubber based coatings used in various layerings again with polyester fabrics providing the core strength. Rubber has a better resistance to UV than PVC, folds better for packing away and is more durable, however the fact that it folds better is a sign of its flexibility and it is not as rigid. The range of colours rubber coating come in are rather limited, it creates more drag and is more expensive than the PVC coated materials. In addition the seams cannot be welded and the gluing process is more time consuming and therefore more expensive and the final seams are not as strong. Finally we have Polyurethane / Urethane coated fabrics which have some of the rubber properties being highly durable and more expensive but some of the PVC properties with low drag, high rigidity and enabling strong if expensive welded seams. On the downside it has poor UV resistance unless coated with a special coating so is probably best suited to the domestic market where UV exposure is limited to days out now and then. As we look at the way the craft are put together you will see how some of these properties might be more or less beneficial and later on we will try to identify which manufacturers use which type of material. Chambers, Floors and all that! We take one of the materials above, create some shapes and pump it up. How does the way those shapes are put together affect the overall rigidity and performance of the resulting kayak or canoe? Our top class sprint and marathon paddlers who spend all their time worrying about how to get a little more speed out of their canoes and kayaks know only too well that the more rigid their boats and the less they flex the faster they will go. A lot of money and design time goes into just this topic. Exactly the same applies to the inflatable canoe or kayak. Achieving a similar level of rigidity to that achieved with hard shells is the key to getting a simliar level of performance. There are a number of ways that the inflatable designers try to achieve this. Most inflatable kayaks have a floor and some combination of two side chambers running the length of the boat. The cheaper boats have floors made with a series of interlinked chambers sitting side by side like a row of organ pipes creating a flat bottom a couple of inches deep. These interlinked chambers are inclined to be at risk of bursting if the air inside them gets hot and expands in the sun so look for pressure relief valves to avoid this experience. This method provides some rigidity. The shape of the side chambers can add more rigidity. In some cases the manufacturers create a shell and fill this shell with blow up, air tight, waterproof bladders, in others a single skin of material is used. The side chambers which run along the length of the boat will be more rigid if they are made of two tubes stacked one on top of the other rather than a single larger tube. 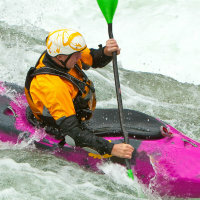 The technology used in modern inflatable SUPs is being used in the bottoms of some inflatable kayaks. This involves the use of drop stitch flooring. Two sheets of PVC are linked together by lots and lots of small filaments of nylon which hold the two sheets together parallel to each other when inflated. The level of rigidity gained by this method and the lightness of the product is quite remarkable. It is used to make flat sections which can either be dropped in to replace an existing floor or be used as the floor itself. It does create a very flat hull shape which does not track well so is usually accompanied by a skeg fitted to the bottom to aid with tracking. Other items to look out for to aid rigidity include a backbone that runs the length of the kayak which creates a V shape in the hull and helps with tracking as well as rigidity and light aluminium frames used at the bow and stern to aid shaping and rigidity again helping with tracking. Most of the inflatable kayaks of any quality have 3 chambers these being the floor and a chamber on each side. 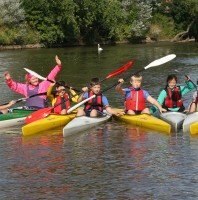 Now we have dealt with most of the construction features we can look at what shapes and sizes the inflatable kayak comes in. These kayaks (and canoes) usually accommodate one or two adults with the possibility of including a child a well. Some of the boats are shaped to resemble either a kayak shape or canoe shape with a tapered bow and stern whilst others make little effort to look like anything more than two tubes stuck together bluntly at the front and back with a floor. Some can be converted into catamarans with cross beams to create fishing platforms and mount motors whilst others are small short boats just long enough to seat a medium sized adult. Your sitting position and the size of the side chambers are important factors to look at. If the side chambers are very deep and / or wide and you are quite small you may find you have a long reach to the water with your paddles especially if you are sitting quite low in the boat. In addition the wind will catch the sides if they are very deep. Conversely you sit a little higher in an inflatable kayak than a conventaional boat as the floor is deeper. This is especially true if you are sitting on a seat with any height. Because these boats are generally quite wide this should not be an issue but if you are on the heavier side be sure you will be stable and if you are on the smaller side make sure you can reach the water! 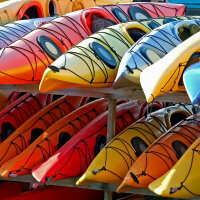 Look out for subtle additions like storage space and storage hatches if you plan on using your kayak for longer trips. Don't forget the inflatable SUPs which we will look at on the SUP page.